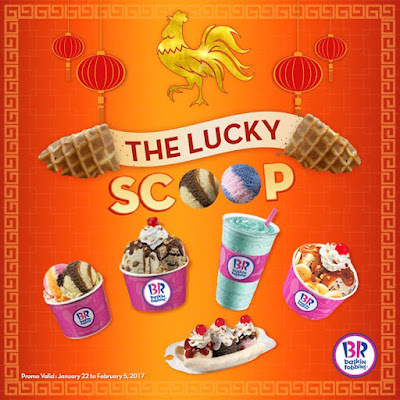 Good news Baskin-Robbins fanatics, in celebration of Chinese New Year, Baskin-Robbins, the world’s most loved ice cream brand, lets you try your luck to enjoy an extra junior scoop of your favorite flavor for free! Simply buy any of the participating Baskin-Robbins’ delicious treats and get a chance to crack open a fortune waffle for your free junior scoop. The Baskin-Robbins treats included in this promo are the Double Value Scoop, Sundae, Banana Royale, Banana Split and Milkshakes. This fun offer is ongoing from January 22, 2017 until February 5, 2017. Visit Baskin-Robbins shops at the Central Square, Bonifacio High Street, Uptown Place Mall, and SM Aura in Bonifacio Global City; Greenbelt 5 and Glorietta 5 in Makati; Fairview Terraces, Trinoma Mall, SM North (Main Building and The Block) in Quezon City; SM Southmall in Las Pinas; Solenad in Sta Rosa, Laguna; SM Dasmariñas in Cavite; and SM Pampanga. For more information, log on to www.baskinrobbins.ph or check out their social media accounts: facebook.com/baskinrobbinsph, Twitter, and Instagram @baskinrobbinsph.